Administers the State Govt. schemes i.e. concessions, facilities and assistance for setting up industrial units, has 34 District Industries Centres & 7 sub-centre’s for discharging its functions. Issue temporary/permanent registration certificate of SSI Units in its branches at 34 district industries centers. Submit proposals viz Industrial Entrepreneurship Memorandum to Govt. of India for establishment of major and medium industries. Issue License for production of Gur/Khandsari as per Sugar Control Order 1966 and Rajasthan Khandsari Order 1974. Enforces the laws relating to weights & measures under Legal Metrology Act 2009 Grants subsidy to Food Processing units. Has 28 regional offices spread throughout the state. Develop industrial areas with complete infrastructure facilities and makes available industrial land to small, large and medium scale projects. Provide rebate and incentives for development of small, medium & large scale units. Provides financial assistance to industries for project loan, working capital, hotels and tourism related activities, amusement park, rope ways, water parks, resorts etc. Provides variety of technical input like relevant technical information project briefs, market surveys, financial and management consultancy etc. Organises Investor Promotion Camps and undertakes various activities for attracting investment in Rajasthan. With a view to promote innovations and new technologies, especially in IT Sector, RIICO in association with SIDBI, has launched Rajasthan Venture Capital Fund operating from Udyog Bhawan, Tilak Marg, Jaipur. The Fund, which is managed by Rajasthan Asset Management Company Private Limited, a private sector autonomous organization, is providing financial assistance and mentoring services to projects located in Rajasthan and NCR. Provides all kind of investment related information to medium and large scale industries as well as to NRI investors. Promotes investment in various sectors viz industries health, infrastructure, education, energy, urban infrastructure, agriculture, tourism and IT & ITES. BIP is single point of contact for investors to provide complete back-up support, right from the conceptualization of the projects to their fructification. It is also the nodal agency for DMIC project in the State. RFC has its branch offices throughout the State and caters to the financial needs of new industries, modernization, expansion, diversification and renovation of the existing ones. RFC acts as a Catalyst of development for translating into practice the industrial policies and priorities of the Central and State Governments as also for providing financial assistance in the planned and balanced development of industries, particularly in the small and tiny sectors. Provides financial assistance and incentives to small industries and handicraft units Develops markets for and facilitates marketing of handicraft units. Provides export infrastructure and logistics support, establishing and operating Inland Container Depots (ICDs) at Jaipur, Jodhpur, Bhiwadi, Bhilwara and Air Cargo Complex, Jaipur Airport. Provide raw materials & market assistance to SSI Units, iron steel, steam coal & polymer product to SSI Units for steel furniture’s, tent to tarpaulin, desert cooler, RCC pipes, polythene bags, braided wires, angle iron posts. Rajasthan foundation is a platform for strengthening bonds with the Non-Resident Rajasthani's and is facilitating steps taken by them to contribute to the growth and development of the land of their origin. It is having a close and continuous interaction with the NRRs of the various cities of India and Abroad. Imparts training to handloom weavers providing latest design and technique for handloom fabrics. It is creating avenues of employment in the rural non farm sector by providing those linkages with market and latest technology. Presently this agency is carrying its activities for development of artisans in six sub sectors viz. wool & textile, leather, stone ceramic & potteries, handicrafts, handloom and khadi village industries. Other initiatives taken for development of Kota Doria, Sanganer & Bagru handloom block print and Godunda Terracotta project. It is nodal agency for development of energy from renewable energy sources and is also State designated agency for promoting energy efficiency and energy conservation RERC is installing SPV domestic lighting system, street lighting systems and solar pump sets. Doing generation work, operating & maintaining all the thermal power plants located at Kota, Suratgarh, Ramgarh (Jaisalmer), Mahi and Chambal river projects. Transmission Work for operating & maintaining of all transmission lines and all grid sub stations of 400kv, 200kv, 132kv & 66kv lines. Has offices spread over various places/areas in the State and entrusted with power distribution to the consumers. Also offers many incentives such as interest free loan for the expenses on service line for high tension, tariff rebate, grant of permission for DG sets, Exemption of Electricity Duty for captive power units etc. for new industrial setup. Address of each Vidyut Vitran Nigam Ltd. with their Jurisdiction, is given below. Distribution of Electricity in the districts of (i) Jhunjhunu (ii) Sikar (iii) Nagaur (iv) Ajmer (v) Bhilwara (vi) Rajsamand (vii) Udaipur (viii) Chittorgarh (ix) Durgapur (x) Banswara and (xi) Pratapgarh distrcits. Distribution of Electricity in the districts of (i) Sri Ganganagar (ii) Hanumangarh (iii) Bikaner (iv) Churu (v) Jodhpur (vi) Jaisalmer (vii) Barmer (viii) Jalore (ix) Pali and (ix) Sirohi districts. RERC was set up on 1.6.2000 by the State Govt to bring about the efficiency in operations and to facilitate privatisation in power sector under Rajasthan State Power Reform Act 1999. RERC is thus issuing new/stop licenses, fixing/regulating power tariffs, suggesting State Govt. about the power companies to act honestly, more efficiently, to keep transparence with the consumers, to decide responsibility and to establish power distribution technique standards & consumers' safety. RERC resolves the problems/ grievances/disputes in the matter of electricity on the hearing the party involved. According to Rajasthan Land Revenue (conversion of agricultural land) Rules 2007, Collector is empowered for conversion of land (i) Residential (colony/project) upto 50000 sq mtr. (ii) Commercial use upto 10000 mtr. (iii) Industrial use upto 1 lakh meter. (iv) For institution of health facilities upto 10000 mtr. (v) For public benefit project upto 50000 sq mtr. Besides, issues authorization certificate for the godam for explosive material. There are 188 sub divisional offices in the State, which are 4 to 6 offices in each district.The role of each sub divisional office in the industry is to allot land as per power assigned under the provision of Rajasthan Land Revenue (conversion of agriculture land) Rule 2007. Permission is granted for conversion of land (i) For Residential upto 2500 sq mtr (ii) For commercial (except cinema, petrol pump/godam for explosives, multiflex, hotel & resorts) upto 100 sq mtr. (iii) For industrial upto 5000 sq mtr (iv) For institutions and health facilities upto 2500 sq mtr (v) For public benefit project upto 5000 sq ft. Located in each district headquarter. Explore & Develop of oil & natural Gas in the State. Construct godowns and warehouses in the State for scientific storage of agricultural produces, seeds, manures, fertilizer & other notified commodities of the farmers, cooperative societies, traders, Govt. & other institutions. Procures milk from all the affiliated milk producers, cooperative unions and arranges for the marketability of milk & its products. It is a multi-dimensional art centre of the State. Its programmes and activities are organised by four divisions – Music & Dance, Theatre, Visual Art and Documentations. The main aim of the Kendra is to present and promote the contemporary and traditional art forms and conserve it in its authentic forms and to organise various exhibitions and workshops. Provides Plant & Machinery on hire/Purchase and also establish the machinery at the place of the entrepreneur for running condition arranges training also this purpose. Guides the entrepreneurs for setting up of industry, prepare projects reports etc and impart training. Assistance/consultancy to prospective entrepreneurs and existing units. 0 Preparation of State industrial profile, District Industrial Potential Surveys, sample surveys etc and production indices. Preparation/updation of project profiles, feasibility reports etc. Recently, the institute is working for cluster development in the State of Rajasthan under Small Industry Cluster Development Programme. Help to Rajasthan Small Industries Corporation (RAJSICO) in Inspection of Stores. 3. Organisations issuing licenses/certificate as per legal provision under the respective Act. Registers Partnership firms as per Partnership Act 1932. Administer laws relating to Rajasthan State Sales Tax Act. 1954 & 1955, Central Sales Tax Act. 1956, Rajasthan Entertainment & Advertising Act 1957 & The Rajasthan State Electricity Duty Act 1962 and collects State Tax Revenue, having 13 Zones & 128 Circle offices (24 Special + 72 Regular+ 20 Anti-evasion + 2 Works Contacts) spread over the State. Circle Offices function in registering the name of the unit & assessing the sales tax. Grant/renewal of manufacture license/registration certificates (to new additions) for insecticides/pesticide products. Issue license for manufacturing of Organic/Bio Fertilizers in the State under Fertilizers Control Order, 1985. Renewal of license regarding sale of all type of fertilizers. Issue license for manufacture of medicines/drugs etc. Monitoring of quality of Drugs & Cosmetics, manufactured by respective state units and those marketed in the state. Investigation & prosecution in respect of contravention of legal provisions. Issue of license & Registrations of Food Safety and Standards under the provision of Food Safety & Standard Act 2006 which is in force since august 2011. Water to be used for processing. The Act was promulgated by Parliament in 1954 to make provision for the prevention of adulteration of food, along with the Prevention of Food Adulteration Rules, 1955 which was incorporated in 1955 as an extension to the Act. Broadly, the PFA Act covers food standards, general procedures for sampling, analysis of food, powers of authorized officers, nature of penalties and other parameters related to food. It deals with parameters relating to food additives, preservative, colouring matters, packing & labeling of foods, prohibition & regulations of sales etc. Like FPO, amendment in PFA rules are incorporated with the recommendation made by the Central Committee of Food Standards (CCFS) which has been setup by Central Government under the Ministry of Health and Family Welfare comprising members from different regions of the country. The provisions of PFA Act and Rules are implemented by State Government and local bodies as provided in the rules. Under the provision of MFPO all manufacturers of meat food products engaged in the business of manufacturing, packing, repacking, relabeling meat food products meant for sale are licensed but excluding those manufacturers who manufactures such products for consumption on the spot like a restaurant, hotel, boarding house, snack bar, eating house or any other similar establishment. The main objectives of the MFPO, 1973 are to regulate production & sale of meat food products through licensing of manufacturers, enforce sanitary & hygienic conditions prescribed for production of wholesome meat food products, exercise strict quality control at all stages of production of meat food products, fish products including chilled poultry etc. Chief Medical Officer located in each district in the State controls the prevention of Food Adultered in the State. Issue licence for milk and Milk Products /Food and Vegetables Products & Meets Products. Registeration of Trade Marks are for individuals name, firms name, company name & also for series/letters/numericals/colours/sound/ music/smell/shape of goods/slogans etc. A Design refers to the features of shape, configuration. Pattern, ornamentation or composition of lines or colours applied to any article, whether in two or three dimensional (or both) forms. This may be applied by any industrial process or means (manual, mechanical or chemical) separately or by a combined process, which in the finished article appeals to and judged solely by the eye. Design does not include any mode or principle of construction or anything which is mere mechanical device. It also does not include any trade mark or any artistic work. Regional offices are 13 at Jaipur, Alwar, Balotra, Bharatpur, Bhilwara, Jodhpur, Pali, Kota, Chittorgarh, Kishangarh, Sikar and Udaipur. 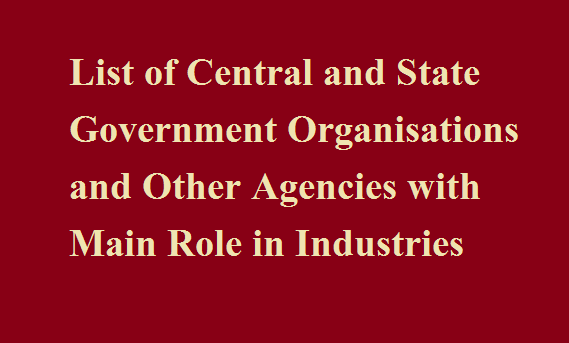 To establish/to operate Red & Orange category of industries. Green Category which are discharging waste water/air emission which do not require any treatment to confirm the discharge of emission standards required by the board. Under Municipal Solid waste (Management & Handling) Rules. Under Bio-medical waste (Management Handling) Rules. Training on ISO 9000, 14000 etc. Provides better marketing facilities adequate retruns on agriculture commodities and implementation of Mandi Regulation Management. Administers the provision of factories Act, 1948 Indian Boilers Act 1923 & Payment of Wages Act 1936 for Safety, health and welfare of the factory workers. Enforces various Labour laws. Take measures to control strikes & lockouts. Registers trade unions in the State. Issues license for preparation of Ayurvedic Medicines etc.